When I first learned that I was getting hired in the district where I currently work, I was beyond thrilled. 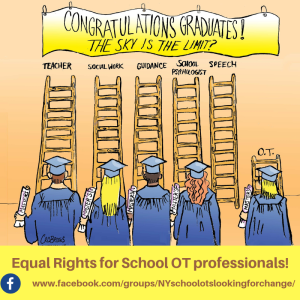 A school district job! It’s like winning the lottery! I would be split between two schools. Okay…I can live with that. Ummm, I’m not sure I can live with that! A million scenarios ran through my head- Will they listen to me? What if they’re rude? I’m so used to the little kiddos – will I be able to do it? Butterflies were flying wildly in my stomach. Self-doubt had totally set in. But to tell you the truth – I loved it. The kids were great. Teenagers are just big kids, full of laughter and good-natured mischief. What really did stink? All the Handwriting. Oh, the handwriting. Reading messy handwriting is seriously torturous. Like… comparable to squinting at the sun. Trying to decipher the messy scribbles of a tired, bored pre-teen or teenager can be very frustrating. And trying to get that teenager to improve horrendous handwriting can be a giant challenge. Children with handwriting difficulties are becoming more and more common. 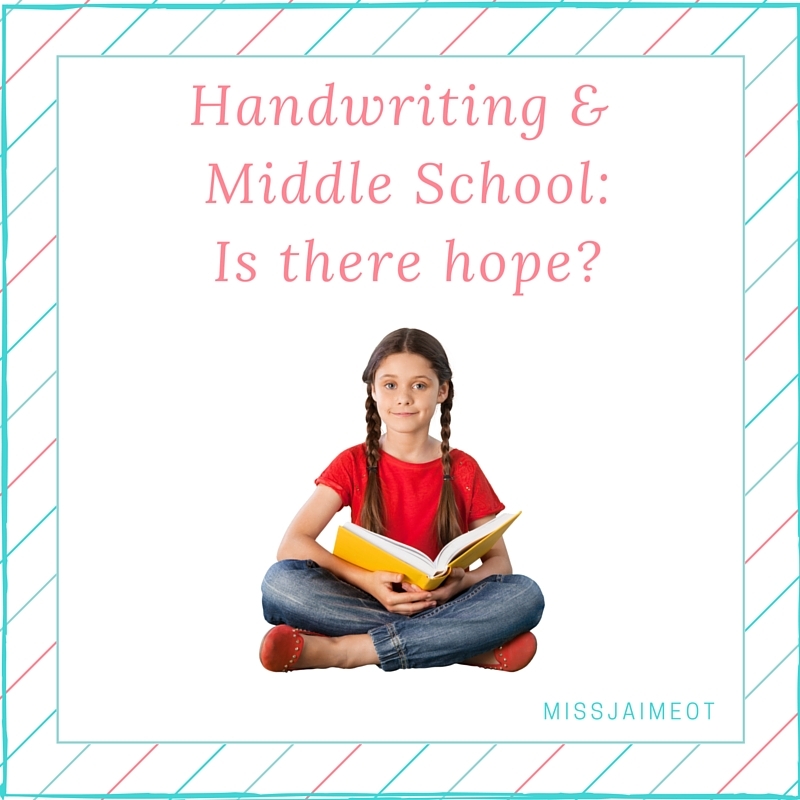 Handwriting continues to decline in importance in our school curriculum, and many elementary teachers don’t have enough time in their schedule to teach handwriting properly. Handwriting instruction is often abandoned in the classroom after first grade. But it’s still important. So what about handwriting in middle school? Middle school teachers are stuck with the task of finding ways to increase legibility. After third or fourth grade, it is very hard to change handwriting habits, especially if the student isn’t motivated. I have a trick for that. There is hope, though. I promise. 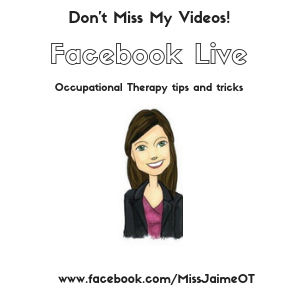 Today I’m sharing some more of my favorite Occupational Therapy tips and tricks to help increase legibility. Be sure to check out the Middle School Part 1 post for more information. First, you need to get the kids writing. As an Occupational Therapist in a middle school, many of my students had handwriting goals. 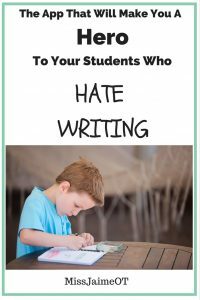 The kids would groan and moan the minute I would introduce a handwriting task – usually something that they were already doing for class, such as writing definitions or copying vocabulary. In my middle school, kids come into an academic class like Science or Math, copy their “Do Now” (a math problem or notes on the board) and begin working. This limits socializing and gets the kids right into working. You can use books of interesting facts, short excerpts from that day’s news, writing prompts, or seasonal information to get them writing. Get vocabulary lists from the children’s teachers in advance. This would also be a good routine for Resource Room teachers who want to work on handwriting (or keyboarding). Research shows that handwriting is a good predictor for the quality and length of written compositions (Baker, Gersten, & Graham, 2003). This makes sense because if kids dislike writing, they will write less, leave out details, and offer less complex answers. It’s important to find ways to keep handwriting in the routine. Get them writing. Most teachers don’t realize that copying from the board (far point) and copying from a paper at their desk (near point) are two very different skills. Far point copying is often more difficult. That can be due to different reasons. Children with attention issues get distracted as they change their gaze from the board to the paper. Also, there is a sensory component in changing the position of the head from a vertical position to the horizontal position. It can also be due to difficulty with visual perception. If you have a student who can copy near point but has trouble with far point, you can use a “Page up” or a Vertical Page stand. This brings the information closer but still incorporates the “changing of the head position” component. Then you can gradually move the stand away, use a classroom easel, etc. Handwriting and Middle School can be complicated. Kids need to learn how to read different fonts. Children who have difficulty with visual perceptual activities often have trouble recognizing different fonts. One strategy that Special Education teachers use to help children with reading & copying is using a very basic easy-to-read font such as Times New Roman or Aerial. This is a great strategy when the focus of the activity is something other than copying or handwriting. However, when the focus of the activity is to improve handwriting and copying skills, it’s a good idea to change up the fonts. Often. Sometimes, children struggle with handwriting due to poor visual perceptual skills. Reading different fonts can be difficult at first, but it can help visual skills like closure, figure ground, and form constancy. 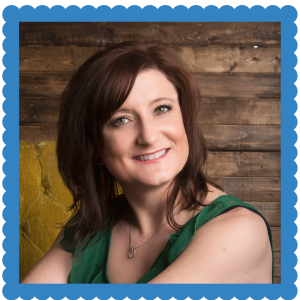 Check out this awesome post by my pal Cindy over at Your Kids OT about visual perception and handwriting. So, make up a “Do Now” paragraph for kids to copy either near point or far point. Use different fonts so your students can learn how to read various typefaces. A classroom teacher could easily change the font on the smartboard or their class notes page to achieve the same goal. Once the kids get used to copying every day, you can start to work on other skills. You can change the “Do Now” paragraph to work on multiple skills. The kids need to copy it properly (not copying the errors). Depending on the capabilities of the class, you can work on one thing at a time or multiple goals at once. A simple checklist is a great resource for getting kids to take responsibility for their own work. 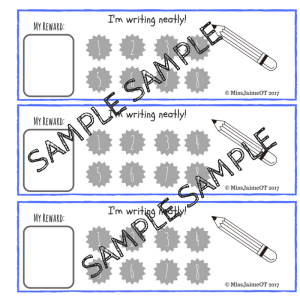 You can print multiple copies and give each child one to check off every day, or you can laminate one copy and give the kids a dry erase marker to check off each bullet as they complete a work check. I know it sounds ridiculous, but when I buy the skinny dry erase markers (not a fan of large writing utensils) in different colors, the kids actually enjoy using them to check off the boxes. 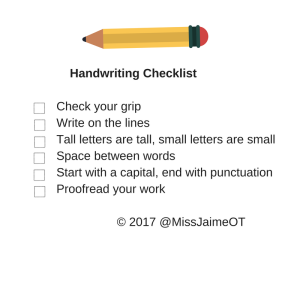 You can make your own checklist or download mine for free here. A simple, easy to use checkoff list for kids to self-check their handwriting. Print yours for free! A reading ruler can help children to stay online when writing (and reading). It blocks out the rest of the page which eliminates visual distractions for kids who get overwhelmed by too much on a page. 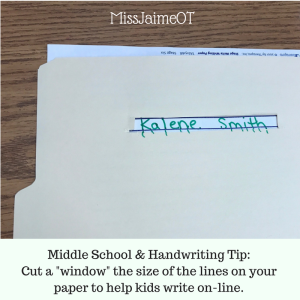 It can also be helpful in getting kids to write on the lines of the paper. Kids who have difficulty with bilateral coordination (using two hands together) may have trouble holding the reading ruler steady while writing with the other hand. These kids also have trouble using a ruler to draw a straight line. Like a reading ruler, a writing window can help a child to write within a set section of the page. This can help with math. Many children with handwriting difficulties also don’t organize their information properly on the page. 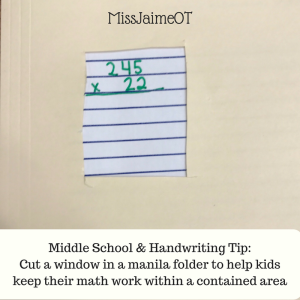 Graph paper or graphic organizers give visual boundaries, but writing windows can be helpful to get kids to write their work within a set area. Like a reading ruler, it can also help children to write on the lines. I like to just use a manila folder. Use a box cutter or scissors to cut the window to the exact size you want. Cheap and effective – perfect for a budget diva like me. If you have a child who consistently makes a certain letter wrong, you can try using a letter checker with them. To make a “letter checker”, just use a hole puncher to make a hole in the middle of an index card. Then have the student place the hole over each letter to see if it actually looks like the letter. Sometimes it can be really tough to tell what a letter is without all the writing around it. As I wrote in “Middle School & Handwriting -Part 1”, sometimes you just need to increase the child’s awareness about what is making their work so messy. Most big kids want to do well just as much as the little ones. They may just need something to motivate them. A simple reward chart can work wonders if a kid really wants something. Sometimes you need to get parents involved- especially when the child wants to earn money. But many parents are willing to get involved if they think it might help! Make a simple reward chart, or you can download mine here for free! I hope you’ll try out some of these strategies with your child – they really do work! 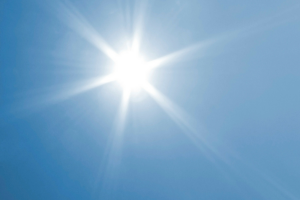 Squinting at the sun isn’t good for anyone. Get them writing with these simple strategies and enjoy the results. 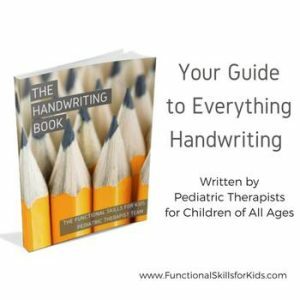 Don’t forget to check out “The Handwriting Book”, a book written by the fabulous “Functional Skills for Kids” team of OTs and PTs. 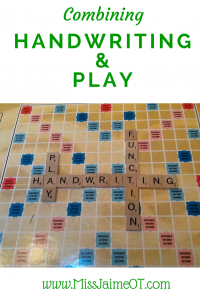 It’s chockful of resources, activity ideas, and everything you ever needed to know about handwriting! 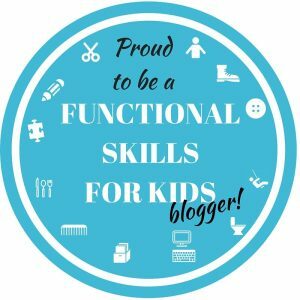 Check out our new Functional Skills for Kids Webpage here! Become A Miss Jaime, O.T. VIP! Never miss a post! We respect your privacy and will only be sending you the latest OT tips and tricks! Activity ideas, OT hacks, and coupon codes are coming your way…. Wonderful article that I will be saving and referring to! Thanks for the link to me too! I have an 8th grader with a goal to decrease uppercase substitutions (B,N and D). It’s impossible to change his motor planning/formation at this age, however I’ve implemented a writing checklist for him to complete to self-edit. It’s just NOT working. He isn’t motivated to use it, as he rushes through his homework to play video-games 🙁 and feels as though editing is additional “homework”. During sessions we work on using the checklist together and he catches the errors and fixes the uppercase substitutions. He’s also able to write legible when tested randomly for vocab tests using a three-lined ruled paper. I’m just completely stuck on where to go from here. I’m considering using a college ruled paper to see if this will help with spacing and legibility since he tends to write larger due to poor grasp and decreased distal control.